Folk legend Vin Garbutt is coming to Gainsborough this month for a live show at Trinity Arts Centre. 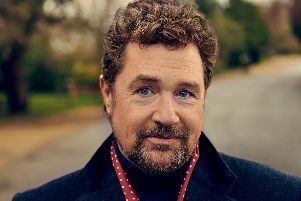 Winner of BBC Radio 2 Folk Awards Best Live Act Award in 2001 Vin Garbutt has been a regular at British folk music’s top table for many years. Powerful, hugely moving, warm, humane, inspired, funny and gut wrenchingly honest are just some of the superlatives used to describe Vin’s performances. His songs are inspired by the folk tradition, but have transformed into gritty social comment and life observations. He is renowned for his hilarious intros, but for him his song lyrics are the crux of his performance. As the English Folk Dance & Song Society put it: “It’s a true gift to be able to make us laugh and squirm at the same time, but Vin does both. Vin Garbutt is at Trinity Arts Centre on May 21 at 7.30pm. To win a pair of tickets to the show, simply tell us in which year did Vin Garbutt win the Best Live Act award at the BBC Radio 2 Folk Awards – a) 1981, b) 1991 or c) 2001? Closing date is May 13 and normal competition rules apply.